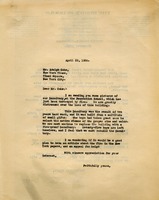 Letter discusses the school's financial accounting and compares it to other institutions. 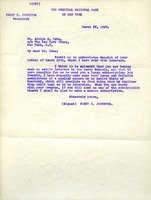 Mr. Wiggin writes to Adolph Ochs with his contribution that he had lost track of organizations who had his name, and was reminded by Mr. Ochs. 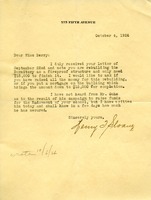 Sloane inquires about the status of fundraising for rebuilding the burned dormitory and reports that he has written to Mr. Ochs about the endowment campaign. 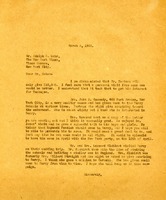 Letter talkes about the need to replace the burned dormitory at the Foundation School and a possible article in the New York papers. 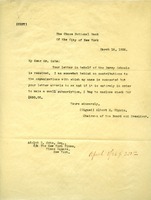 M. E. Seabrooke, secretary to Robert A. Franks, writes to Mr. Ochs, explaining that Mr. Franks will be out of town until April 1 and says that he has received his letter and will bring it to Mr. Franks' attention as soon as he returns. 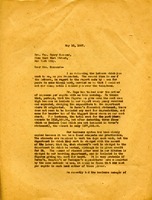 This is a letter from the New York Times. 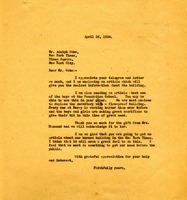 It was written by the secretary of the Publisher, Adolph S. Ochs. 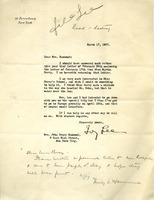 The letter notifies Miss Berry that her letter to the New York Times was received and it will be brought to the Publisher's attention when he returns the following week. 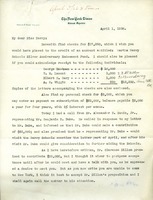 Berry proposes a personal visit to George Eastman in an effort to convince him to donate more than the $10,000 he has promised. 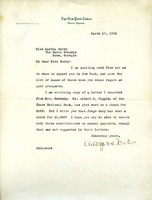 She suggests other potential donors, including Mrs. Leonard Elmhirst (Dorothy Payne Whitney), and asks Ochs to help arrange for Raymond Fosdick (of the Rockefeller Foundation) to visit the school. 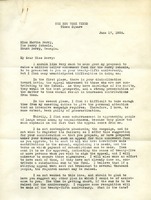 Martha writes to Adolph Ochs with information about the burned building for the New York Times. 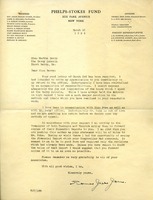 She hopes hopes that being in the New York Times that there will be more help from the public in rebuilding a new fire-proof dorm. 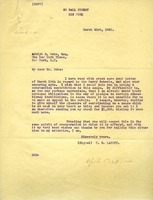 T. W. Lamont sends Mr. Ochs $1000 as a contribution to the Berry Schools.